September | 2013 | The Glyn Watkins Show Page. Is Bradford’s Pie Big Enough for Edinburgh? Bradford City Show. 5:30 pm. Sat 28th Sept. The 2013 Suite, Valley Parade, after the game. A collection will be taken. Multi-media show by Glyn Watkins & Dave Pendleton celebrating the best season and telling some of the best stories. 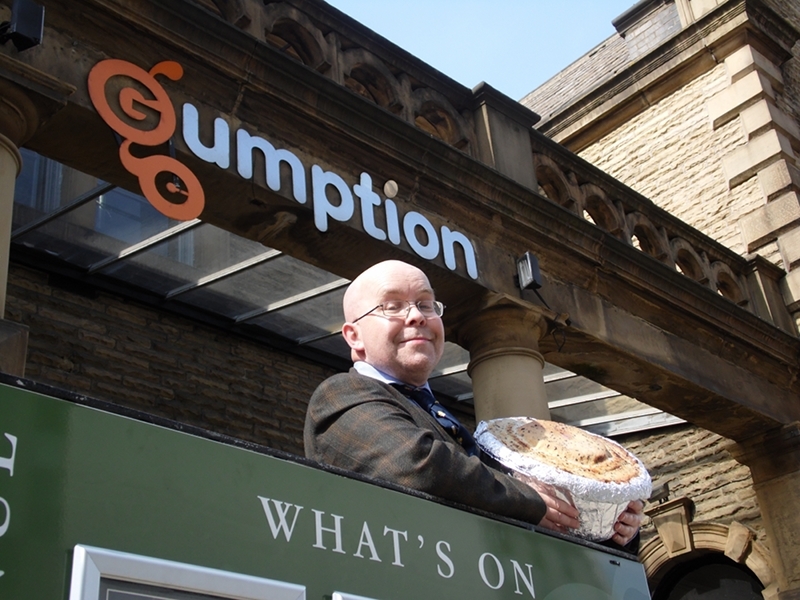 Glyn has also declared that the last show at the Gumption Centre so good, with the best meat & potato pies he’s tasted, that he has already booked the Centre for another pie show, and is thinking about taking his pie to the Edinburgh Festival Fringe next year. Glyn Watkins, Bradford based poet, writer and showman, created the Pie and Priestley event over 15 years ago. The idea came from a wartime BBC broadcast about a Bradford meat and potato pie shop called Roberts which had a giant pie in the window that steamed like a volcano. The shop had been damaged in an air raid but the pie had survived to steam again. Glyn was so happy with the venue, and the wonderfully positive response from the audience, that he already has a show there for National Poetry Day on Thursday 3rd October. Little Horton Lane, Bradford BD5 0BQ – 01274 241111. This is a page about the J.B.Priestley shows created and performed by Bradford based poet, writer and showman Glyn Watkins. If you are looking for Glyn’s blog click this link. Tickets for J.B.Priestley, Pie and Proud of Bradford show only £4 in advance to personal callers at the Gumption Centre, or from me. Use form at bottom to contact me. A celebration of J.B.Priestley’s birthday, a meat & potato pie that defied Hitler, and a City that defies the odds. Performances, pictures, anecdotes and opinions. Tickets £4 in advance, £5 on door. Pie & Peas available on night. Glyn Watkins and big pie at the Gumption Centre, BD5 0BQ, advertising his J,B.Priestley PIE and Proud of Bradford show, 13.09.13. Contact form for general enquires or to be e-mail ways of buying tickets. Bradford based poet and showman Glyn Watkins is bringing his one-man show marking J.B.Priestley’s birthday, after performing last year’s event in Sussex. 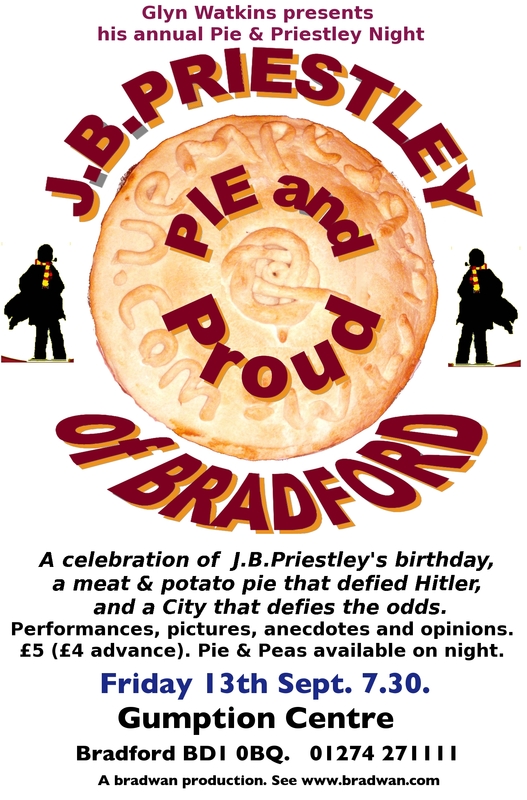 The J.B.Priestley, Pie and Proud of Bradford Show celebrates Priestley’s work, a meat and potato pie that defied Hitler, and a city that defies the odds. It is being presented at the Gumption Centre, on 13th September at 7.30 pm. Tickets for the show are £4 in advance from the Gumption Centre, Bradford BD5 0BQ – 01274 241111, or £5 on the door. Pie and peas will be available, including meat and potato and vegetarian pies. The show features readings from Priestley favourites such as: When We Are Married, as well as stories about his life and home town of Bradford, accompanied by pictures. Priestley was born in 1894, on Mannheim Road in Manningham, Bradford. He became one of the 20th Century’s most successful authors and playwrights, and during the early years of World War II his broadcasts to the nation did much to help morale. Since then he has celebrated this great occasion in Bradford, London and last year in Lewes, Sussex. At each place he walks around the town with a big pie to advertise the event, claiming that there is nothing like a pie to get people talking. This year Glyn is linking the show to the Positive Bradford day on 28th September, and including more stories and pictures about Bradford’s history, especially the area around the bottom of Little Horton Lane, the site of Gumption Centre, at Glyde House. Priestley would have known the area very well, as he was a regular at the 4 theatres that once stood close by, especially the Prince’s Theatre, which stood almost opposite the Sunday School that became Glyde House. Priestley later premiered 4 of his plays at the Palace.